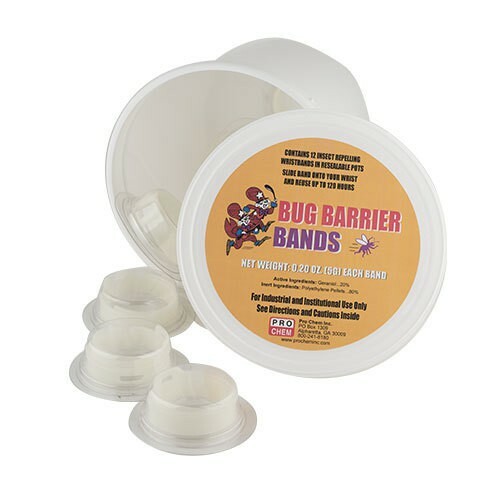 BUG BARRIER BANDS | Pro Chem, Inc.
BUG BARRIER BANDS are an all-natural yet highly effective method of insect repellent. Made from Geraniol oil, they have been proven in various laboratory and field tests to be the best flying insect repellent available. 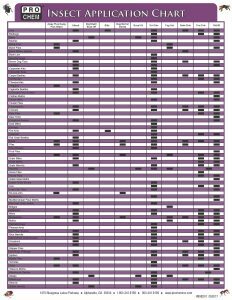 This neutral, environmentally friendly, child safe, pesticide-free product has been proven to be more effective than Citronella. These bands are 20% Geraniol oil molded into polyethylene plastic, creating an ideal way to dispense Geraniol vapors. Many repellents are easily diluted with perspiration, but the wristband keeps working. The band is designed with a patented break-away strap that snaps if the band is entangled and pulls on the person’s arm. It is packaged in an innovative resealable plastic pot, which can be used to store the bands between uses, allowing up to 120 hours of active life. Band can also be worn on belt loops, ankles, and hatbands or applied to other areas where insects pose a threat. It can also be placed in areas around campsites, baby carriages, boats, etc. where insects could be a problem. Wrap band around desired place and resume normal activity. When active life is expired, place in recycling bin with other plastic recyclables. Bands have a 3 year shelf as long as they remain unopened.